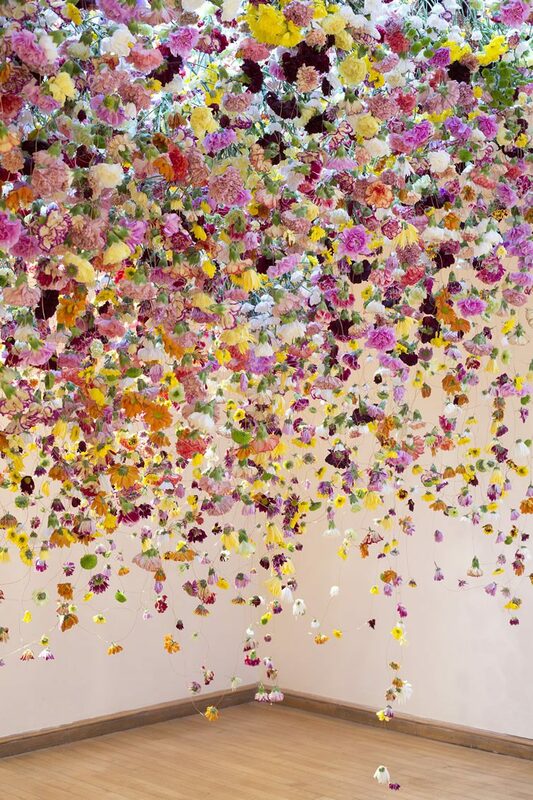 There’s an equal sense of joyfulness and sorrow associated with the work of the British contemporary artist Rebecca Louise Law — a sixth-generation gardener, her young life was preoccupied by gardens and nature. 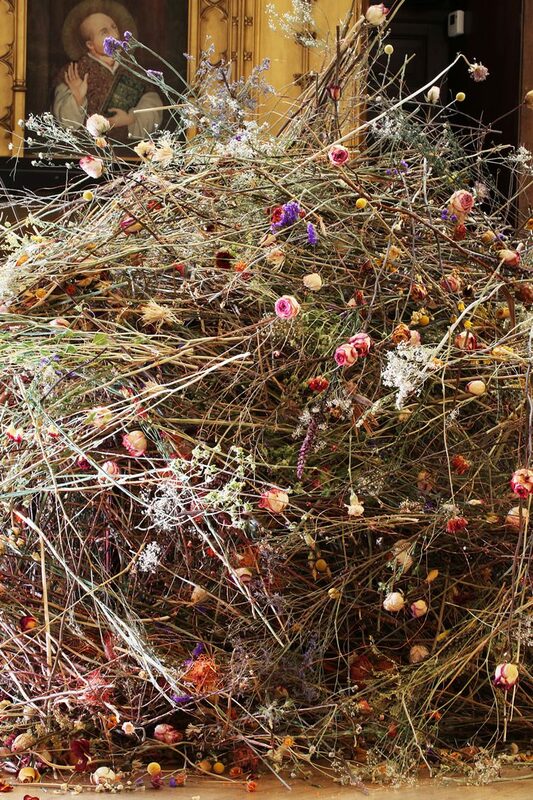 With an ambition to demonstrate the lifecycle of flora, her large scale works feature flowers throughout their natural process, evoking a sense of natural beauty and melancholy. 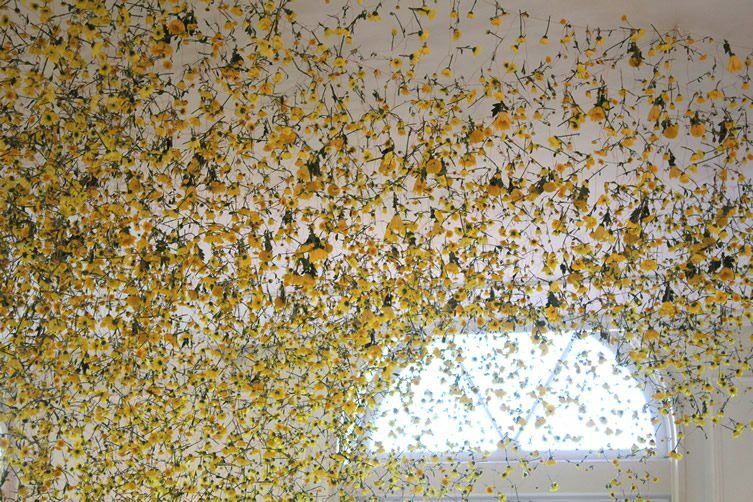 Usually site-specific, her sculptures consist of flowers in their thousands, often hanging from a ceiling, affording a sense of suspended motion. A take on the still life — replacing the painted with the physical — Law’s work has an otherworldly effect, inviting its viewers to challenge the opus in front, above and sometimes below them. Awe-inspiring, her sculptures create stillness in their environment. Blessed with an infinite colour palate, Law’s subject and materials are naturally beautiful. She rarely messes with the stricture of the flower itself, but works with them in their natural fresh or dried states. 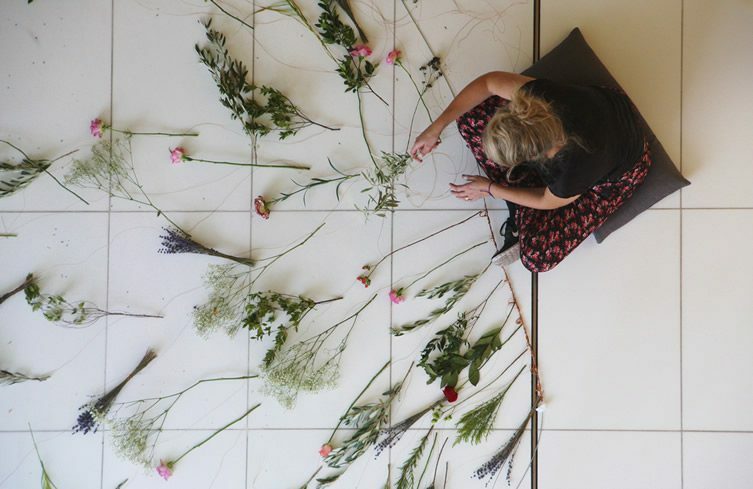 The compositions of each piece subtly demand attention — it is as if she is creating the work for others to engage in the beauty of flowers and nature. When taken out of context — vase; meadow; florist — the flora in magnificent multiples demands that you stand and stare. You’ve been noted as saying that in your work “every stage of a flower’s lifespan can be appreciated” — can you elaborate on the stages the flower goes through, and how we can appreciate them in your works? I really enjoy observing the whole process of a flower’s life — from seed to flower, and subsequently preserving the flower within my work. My installations are designed to start fresh and slowly dry. I like the viewer to observe each stage of preservation and the beauty and form of the flower in its transition from fresh to dry. 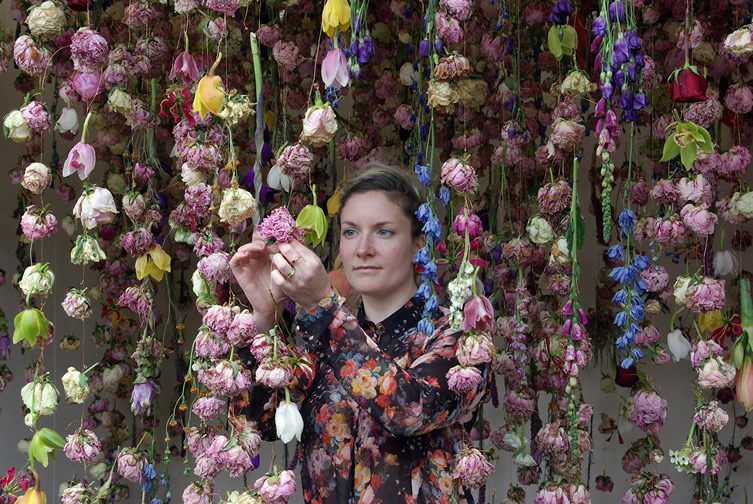 You live and work on Columbia Road where the famous flower market happens every weekend, does it still inspire you? Yes, I love the market first thing in the morning, with the fresh smell of flowers and the buzz of a new day. 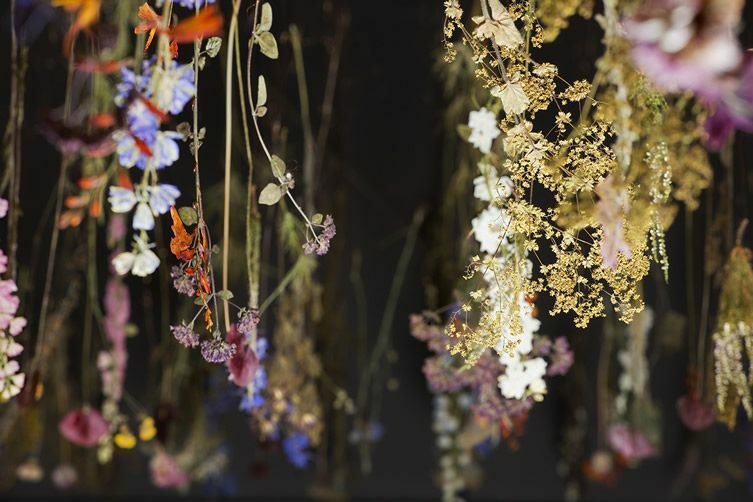 You work with both fresh and dried flowers, can you tell us why, their individual advantages, and how different they are to work with? Flowers are my sculptural material. I am continually experimenting with them, at every stage of their life. 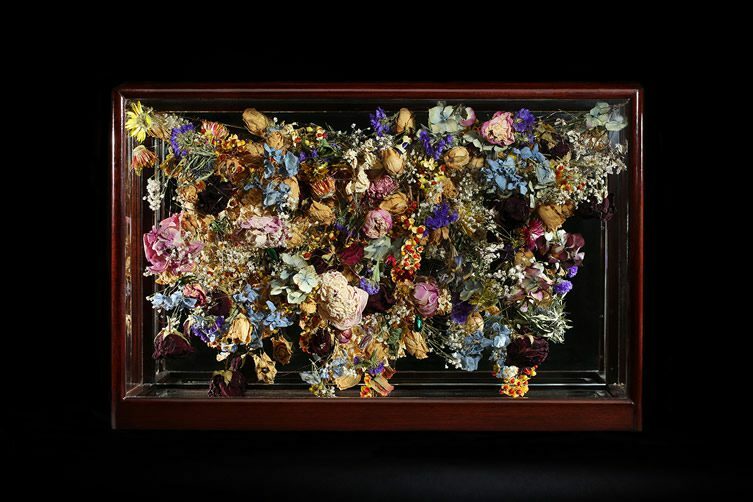 I love to learn new ways of working with the material — the most challenging has been either keeping flowers alive or preserving them. 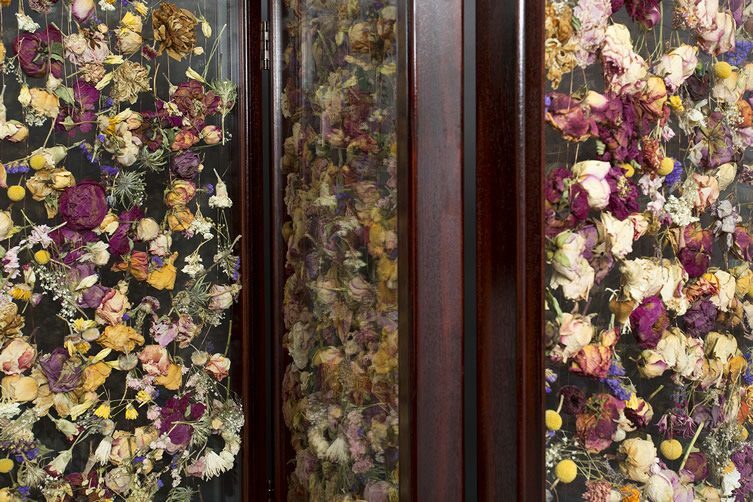 The easiest installations are when I can just let them be, to rot and decay, but I found the most rewarding installations are when the flower can last forever… as a permanent sculptural material. The encased installations have been really exciting. There is physicality to your work: in the materials that you use, as well as the scale you choose. Could you elaborate on that, what is it about the scale that is so important to you? I love challenging the relationship between humans and nature. My work is site specific; I work to the maximum capacity of the space and consume it with nature. By bringing the outside in, I change the perspective — and invite the viewer to interact and respond to the new space. How long does one of your large-scale installations take to make? Between one day and one month, depending on the size of the team. You’ve worked on some wonderful projects with some of the world’s most interesting designers — Hermès; Max Mara; Jo Malone… — can you tell me one of your favourite commercial projects, and why they are so? I love working with Hermès, they always give me complete artistic license within a space. The Royal Opera House, London and La Monnaie in Brussels were incredibly exciting projects with complete support on every level from Hermès. Odyssey Exhibition curated by bo.lee Gallery. 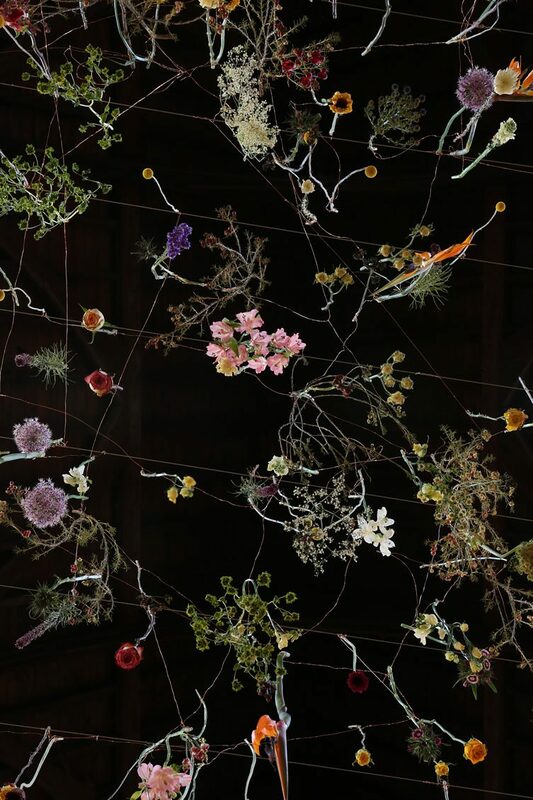 The suspension of flowers features heavily, what is it about the reverse of gravity that works? In various artworks there’s a sense of a time-suspension; mid-movement; a pause in animation perhaps… would you agree? I agree. I feel like it allows the viewer to pause and observe again and again. 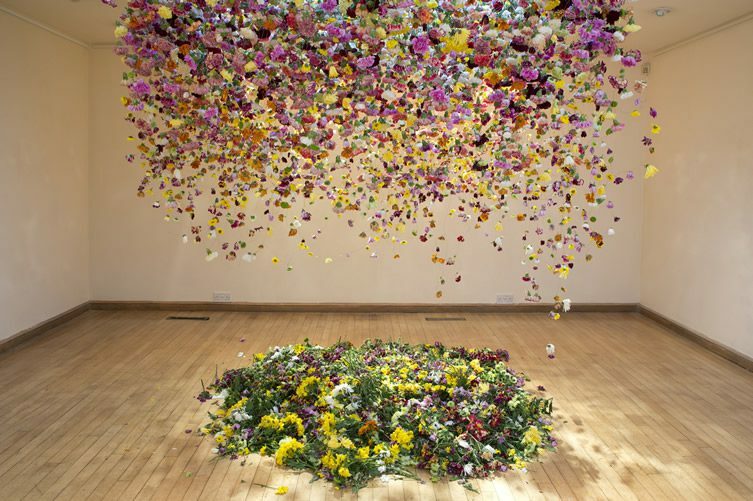 It is very un-natural to create an installation with flowers that won’t move or decay. 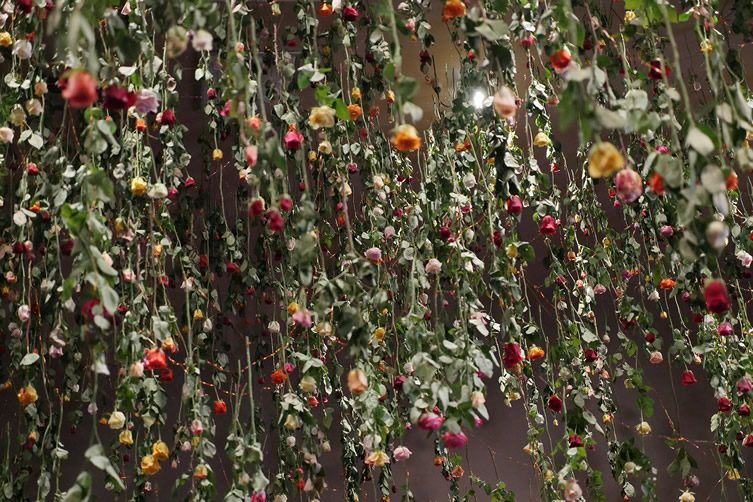 Although I originally started suspending flowers to dry them, it was later that I saw the strength of changing the perspective. Could you please tell us who inspires you and your work? Observing the earth and nature itself inspires me. My parents taught me to appreciate natural beauty from an early age; the way they look at the world has always been an inspiration to me.